Home / Jenny Sez / Happiness isâ€¦ Boxes From the Mailman! 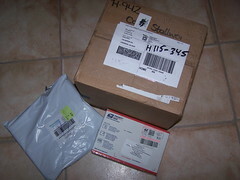 My online shopping spree finally resulted in boxes arriving on my porch. Whoopie! So much fun! 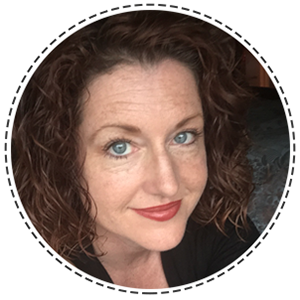 And from so many places…. The smallest box was my order from Prairie Craft. I’ve been experimenting with clear liquid clay mediums, and I hadn’t tried out Kato Liquid Polyclay yet. And you really can just order one thing, can you? I mean, don’t you have to make it worth your shipping? So I also got some “fabulous flakes”- (inclusions for faux dichro effects), a brass cuff form for bangles, and 2 cutters that double as inro forms. This box alone will give me 3 solid days worth of playtime…. The next parcel I opened was from Keepsake Quilting. 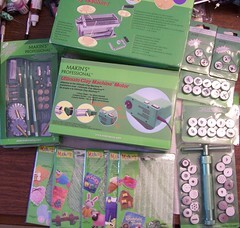 As I mentioned in my post about making Patchfolios, I rarely buy a “set” of fabrics…. just a yard here, a half there, catch-as-catch can. Well, now that I’m back on a sewing kick, I needed some things that well….match. 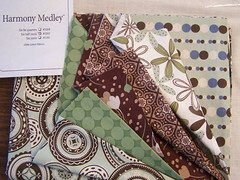 So I bought two of KQ’s “medleys” – six coordinated fabrics from the same line. I got 1/2 yard sets, since I’m working small. 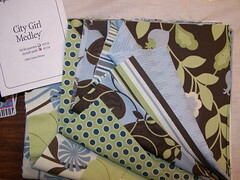 I was looking for yummy colors and a slightly “mod” sensibility. I’m very happy with them, and since all of the fabrics in the set coordinate, I’ll have lots and lots of options. I saved the best, bigget package for last…. my new motorized pasta machine! I waited a long, long, long time for this to get here from CraftTownHobbyLandUSA.com, (long, long story) but finally, I opened it up, and OH! What goodies! In addition to the pasta machine and the motor, I also got a screw extruder set (yes, now I’ll have two), and clay marking tool set (yes, now I’ll have two), numerous dies for the extruder, and 5 sets of texture sheets. (God knows how many I have those now!!!) 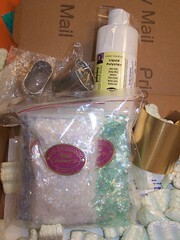 All of this polymer clay goodness for $200.00! I think it’s a deal and worth the wait. So if I disappear off the face of the planet for the next few days, you’ll know why. I’m rolling in my goodies!